The Seas with Nemo and Friends is the second name this pavilion has had. 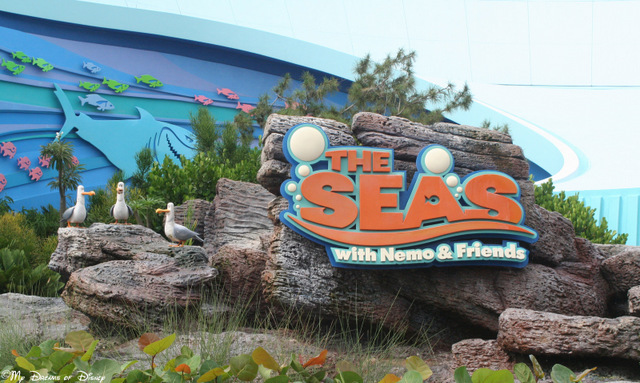 Does anyone remember the original name for the pavilion now known as The Seas with Nemo & Friends? If you don’t remember — or are young enough that you never knew, it was called The Living Seas, and while the structure is the same, some of the theming has changed over the years. The pavilion first opened on January 15, 1986, and featured a short movie called The Sea that showed how the oceans were created, and then you took a ride to the ocean floor on board a “Hydrolator”. After that, you boarded a Seacab and explored the aquarium in the Caribbean Coral Reef Ride. As I was saying, technically, The Seas with Nemo & Friends really isn’t any different from the Caribbean Coral Reef Ride. Of course, though, it is really changed because of the change in theming. Are you able to find Nemo? Turtle Talk with Crush has actually been open longer than The Seas with Nemo & Friends attraction — when it opened, it was an instant success, and has been replicated at Disney’s California Adventure park, Tokyo DisneySea, and even had a small run at Hong Kong Disneyland. In fact, this attraction has been such a hit that variations of it can be found on the Disney Dream and Disney Fantasy cruise ships, and Walt Disney Imagineering even donated a unit to the Children’s Hospital of Orange County Bill Holmes Hospital. This is the first attraction that has ever been put in place in a non-Disney location, and is operated twice a day by volunteer Cast Members. The Coral Reef Restaurant features one side of it being right up against the 5.7 million gallon water aquarium, where you can look at the fish while you enjoy your dinner. There are even a number of special event tours that you can do at the pavilion. Thank you for exploring The Seas with Nemo and Friends with us! I hope you have enjoyed your trip, and kept your feet dry on your journey! Mike, I remember it. I remember never wanting to go as a kid. Now I love it! The Seas with Nemo and Friends is adorable and Turtle Talk is hands down one of my favorite attractions at Walt Disney World. I don’t have kids, but I could sit in there all day and listen to the kids interact with Crush. I love this pavilion! Thanks, Rosanne! I really liked how they put Turtle Talk in at one of the children’s hospitals for the patients to enjoy. It’s so Disney when they do that! Next Post: The Lands of Disneyland: Critter Country!